October is Professional Prep Month at Wake Tech. We have many sessions from job transitioning to networking to making a good first impression. 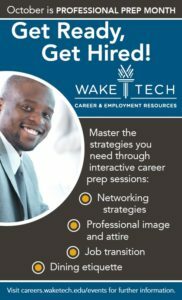 Go to careers.waketech.edu/events for more details or to register for the upcoming sessions. Employment, Interview, Resources, Resume. permalink.